Tagging is a powerfully versatile way to categorize and sort your inventory. With tags you can create very flexible lists and groups of items. 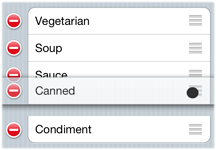 You can use tags to organize items by a commonality, like milk for example. There is evaporated, powdered, fresh, sweetened condensed milk, individual creamer servings, powdered creamer. Some tags that might apply are: refrigerated, dry, canned, milk, sweetened condensed milk, long term storage, fresh, travel necessities, high turnover, family favorite, allergen, dairy, soy, vegetarian. Use tags to group different brands together. There might be four different brands of sweetened condensed milk in your pantry on two different shelves with an extra can in the cabinet with the baking supplies. Tagging keeps them all together. You can create and manage your tags one of two ways. Through the Settings tab> Manage Tags or as you are entering items to your inventory. As you are entering your items into inventory you add tags to an item by tapping the Tags row on the New Item screen. If you already have tags created, they will be presented to you. If you don't already have some tags created or you want to create a new tag, tap the "+" next to Add/Edit Tags. This takes you to the Manage Tags window. Here you can add or delete tags as well as re-order them. Re-order them, why would I want to do that you ask? You might want to group your tags or put them in a particular order. Group common tags together to find them quickly like First Aid items. For example you might want to organize your supplies by gauze, bandage, splint, ointment, pain reliever, etc. Keep your most commonly used tags at the top or the end of the tag list if you prefer. From either of the Manage Tags screens tap the "Edit" button in the top right. This will bring up a screen with red icons to the left of the tags and an icon that looks like a small stack of three lines on the right. Tap the three-line icon and hold it. The Tag you've selected will become active (when active, it appears to be slightly above the other Tags). Drag the Tag to the position in the list you want it to have and let it go. Click "done" in the top right and your tags will be reordered. There are two ways to view tagged items. Entering the tag name into the Search Bar at the top of the A-Z List view or by selecting Tags from the view options on the List tab. Selecting the Tags view will present you with your list of tags in the order you defined. Select a Tag to view all the items with that tag assigned.